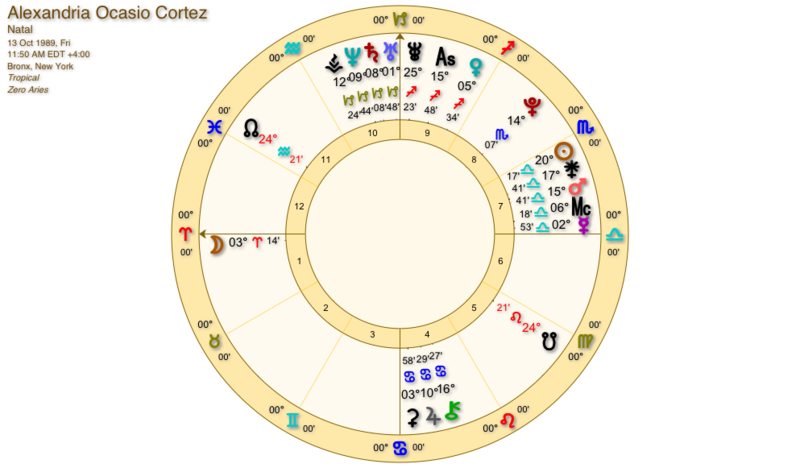 American politics star Alexandria Ocasio-Cortez has a natal chart - or astrological birth chart - which spells serious 2020 success. Kamala Harris is also a Sun Libra political powerhouse - will she become President? We are heading for a mini Age of Aquarius from Christmas 2020. The key words for Aquarius are diversity and equality. That’s why women – of all backgrounds – are going to surge to the top of power from that point forward. Alexandria and Kamala are two impressive examples of the new ‘Aquarian Age’ style candidates. Jupiter and Saturn go into Aquarius in December 2020 and Pluto also goes into Aquarius from 2023. Generation Aquarius voters (Millennials) born with Uranus or Neptune in Aquarius will hear the call. Expect landslides in favour of anyone who isn’t an old-school white man over 60 with a tie! This is an AA (accurate Rodden-Rated) set of data from Astro.com. It’s remarkable to see another Sun Libra woman charging to the top in the United States. In Great Britain, the first and second female Prime Ministers were both also born with the Sun in Libra. Libra rules equality, fairness and justice. It also rules partnerships, and double-acts of all kinds, which work very well for this sign. Beyond the chart we have to look at the cycles or transits for this incoming mini Age of Aquarius from December 2020. Kamala has Saturn at 28 Aquarius in her Eleventh House of groups – which is her political party. That’s actually extremely tough. She will have to really carry the weight of the Democrats on both shoulders and although Jupiter will help her by crossing Saturn in 2021, she will also be moving towards her Saturn Return, eventually. What shape is Saturn in? It’s trine the Sun at 27 Libra and semi-sextile the Moon at 27 Aries. This is actually a fierce fight. Like all Moon Aries people, Kamala Harris is also a warrior. Issues about America’s security with North Korea and Russia genuinely move her. The big, big question is – how is she going to deal with the politics within her own party, never mind the nation? This natal or birth chart for Alexandria, currently huge news in American politics, does not show every single factor. It’s a good basic ‘sweep’ of her personality and destiny, though, and she is destined for massive success in 2020, as Jupiter the planet of expansion, opportunity and rapid growth, goes through Capricorn. As you can see from this chart below, Alexandria Ocasio-Cortez has an unusually high count of factors in this ambitious sign, which takes its time to get to the top (but always does). In fact, the whole cluster in the sign of the mountain goat is right at the peak of the chart, below, in the 12pm position on the wheel. When Jupiter goes across Uranus at 1 Capricorn, Saturn at 8 Capricorn, Neptune at 9 Capricorn and Vesta at 12 Capricorn – a sure sign that 2020 politics for her will be female-dominated – huge things not possible in 12 years are going to happen for this unusual candidate. Alexandria Ocasio-Cortez natal chart in astrology. Asteroid 23238 is now officially Ocasio-Cortez Asteroid, Alexandria’s second prize in high school at the 2007 Intel International Science and Engineering Fair. So, strangely, she does have an astrological connection. Do check the A-Rated birth data available for her at Astro.com. A member of the Democratic Party, she has been the U.S. Representative for New York’s 14th congressional district since 3rd January 2019, when we also saw powerful Capricorn weather, as Pluto, Saturn, the Sun and the South Node all powered across the top of her horoscope. This is how we know for sure that from December 2019 (as Jupiter enters Capricorn) we are going to see massive and rapid success. In January 2019, she became, at the age of 29, the youngest woman ever to serve in the United States Congress. This is the Saturn Return peak (it always begins around age 28 and 29) and it is the beginning of the serious, steady climb along with, typically, huge responsibility. During college, Alexandria was an intern in the immigration office of U.S. Senator Ted Kennedy and graduated in International Relations. You can see Venus, the Ascendant and Hygiea all in Sagittarius in this ambitious politician’s Ninth House of travel and travel in the mind. Journeys, foreign people and places, regional differences, academia, education and publishing. We enter a mini Age of Aquarius from Christmas 2020 as Jupiter and Saturn both land in Aquarius, the sign of community, equality and diversity. Throughout 2021 a radical change in American politics unfolds with more women, more people of colour, more representation from the GLTG sector – and a clean sweep of the suits and ties. Alexandria is fated to play her part. You can see the North Node of karma in the sign of Aquarius in her chart, above. Once Pluto goes through Aquarius from 2023 it will slowly but surely move towards her Node, so in the third decade of this century, she is destined to change the Democrats, and they are destined to change her. It’s a fascinating chart. Watch her! AMAZING! thank you for this. She has reignited the fire in me, that’s for sure. I have more hope for the future knowing she’s got a place in it. Am truly shocked there’s no Gemini?! She is a master communicator- I follow her on Twitter (apparently her IG is even better) – and her ability to break down complicated concepts and explain them in layman’s terms is impressive. Indeed her use of social media etc will undoubtedly change the Democratic Party – it has already, with presidential candidates mimicking her use of IG. Hi Jessica thanks for the article. Do you see similar changes in the UK? A sweep of the suits and ties? I am a middle aged Indian woman , already involved in local England politics but considering the process to become an MP. Do you see any progression or involvement for me as things change and hopefully real diversity arrives in UK politics. Diversity will arrive in British politics with the arrival of Jupiter and Saturn in Aquarius, from December 2020, and then intensely so through the years 2021, 2022, 2023 – after which the old establishment is over. So if you are an Indian woman, you are in a stunning position to take advantage of the change. Apart from anything else, Millennials will slowly become a voting force from December 2020 and as this demographic were all born with outer planets in Aquarius, they understand diversity, community and equality and have no interest in the usual political powers that be! So – your timing will be right. Yet, you may end up wanting something different from power or politics – rather different to being an M.P. Give yourself the space to decide that closer to the time. I had the pleasure of meeting Ms. Harris at a book singing in Los Angeles a few weeks ago. Even though she’s 5’2, she has this undeniable presence about her – strong-willed yet steady, focused yet always smiling. I was so inspired by her that I told her I would help her should she run in 2020 (the rumors were there, but she hadn’t made the announcement yet). The world needs to watch this candidate. She’s a strong contender in an already crowded Democratic bid. I believe she will go far, if not all the way to the White House. Here’s hoping! Astrology Predictions for 2018 Midterm Elections suggest a rebirth for one political party. Who is the younger male politician with a Sagittarius chart signature on a winning streak?